When the Casino at the Empire opened six years ago it instantly became one of the most elegant and exciting venues in the UK. The casino offers a nice little insight to what some might call the "Vegas Lifestyle", a place where it is all about glitter and glam, with a bit of gambling on the side. Located at Leicester Square it is can be reached by public transport or the brave soul can navigate there via car. One of the things that makes this such an exciting venue is the amount of entertainment - with a staggering five bars. The restaurant is based on Asian fusion cuisine and it is definitely a treat on its own. The sportsbar is a personal favourite and combining all of these aspects shows you just why this is a casino well worth visiting. Keep in mind that to get in to the casino you need to be a member - but fear not - membership is free and widely available to anyone willing to sign up. Just remember to bring identification when you first visit the casino. The gambling floor is split over two floors - with some of the most modern and exiting games available to gamblers around the world. In terms of classic casino games this casino offers the likes of Blackjack, Roulette, Punto Banco and Pai Gow. But it does not end there - the casino has a dedicated section for Poker such as Texas Hold 'Em and also a few tables for Three Card Poker. When I mentioned electronic games before, I was talking about slots and electronic roulette. Both types of games are widely available across both floors and we are very impressed with some of the slot games you can play. Since the games are spread out over two floors the whole casino is very spacious and I am really struggling to imagine this place ever feeling crowded. The Casino at the Empire is a place where excellent gambling is combined with even better food and drinks. The five different bars are available throughout the day and nighttime if you feel like a drink to cool down from a long gambling session or if you really want to kick off the night. The sports bar is open and serves alcohol 24 hours a day, seven days a week. Not only that, it shows sporting events from all over the world. Our second favourite place for a drink at this venue is the Icon Balcony bar. This is a place where you can combine drinks with some lighter snacks or dishes if you do not feel like visiting the restaurant. Icon Balcony does offer quite a few promotions on food and drinks on a regular basis so keep your eyes open if you are a bargain hunter. 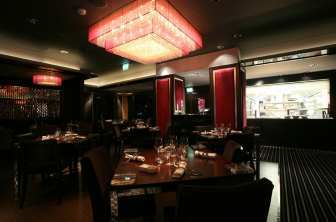 The Fulushou restaurant is one of the most exciting Asian fusion restaurants that you can find in any casino around the UK. The decor has some Asian inspiration and it is a very quiet and relaxing place to enjoy your food - fairly far away from the lively gambling floors. Even though this can seem like a high-end dining experience the food is not as expensive as you might expect. Meals can cost you as little as £17 for the whole dinner - again if you keep your eyes peeled for promotions. The Casino at the Empire might be one of the best UK casinos we have visited when it comes to promotions. If you are a regular reader of our reviews you will know how we love the "Learn to Play" promotions. An experienced dealer will show you the basics of the games available at the casino - free of charge. Another exciting event going on is the Cocktail Mixing class. For just £20 you will have some of the best drink makers in the area show you how to toss bottles, mix spirits and create your own concoctions. Once you enter the Poker room you will see that it offers daily tournaments and to find out more information about times and stakes you should visit their website. Alongside this the casino offers a huge range of promotions and events but listing them all - or keeping track of them all - would take too long. So we suggest that you head over to their website to find out the latest promotions or events being planned at the casino because they are well worth visiting. Why The Casino at the Empire? The Casino at the Empire is a venue that is so much more than just a casino. For the culinary lover the restaurant is one of the most exciting places to visit around UK casinos and with five bars and a nightclub there is never a dull moment around the Empire. Gambling itself is still at the heart of the operation - something which is clearly seen by the amount of tables and games available. For a great casino night out there are few places around the UK that will provide a better night than The Empire. Bars, restaurant, gambling and entertainment all come together to create an excellent atmosphere that you can enjoy 24 hours a day, seven days a week. If this is not enough to convince you, look at the huge amount of promotions that the casino offers or any of the events coming up within the coming weeks.